The Winnipeg Construction Association and the former Manitoba Bid Depository Inc. (MBD), with the assistance of various trade organizations, developed a set of trade definitions in an effort to identify all of the specified project tasks and to categorize by trade the tasks which each type of specialized contractor is best able to perform on the construction site. Under the Trade Definitions the trades, by mutual agreement, determined a basis for identifying the specific aspects of the work for which they would each be responsible. By definition, this is an all-inclusive listing – there should be no tasks or items unassigned. 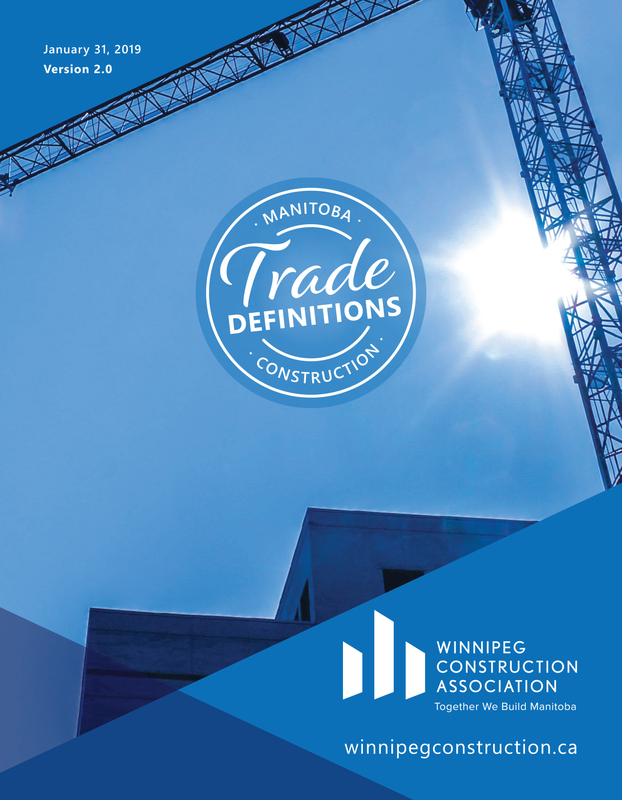 In 2018, the WCA with the assistance of numerous volunteers and several associations including the Mechanical Contractors Association of Manitoba conducted a comprehensive review of the Manitoba Trade Definitions with a view to publishing an updated version early in 2019. It is anticipated that this document will be reviewed on an annual basis. Use of the Manitoba Trade Definitions is a recommended best practice, and its use is entirely voluntary. The Winnipeg Construction Association does not assume any liability for the completeness or certainty of the Manitoba Trade Definitions, nor does it assume any liability with respect to how they are to be used. Please note: The numbering system in this document, and its predecessor, appears to follow a former Master Format numbering system. This is purely coincidental, and comparisons should not be made across these platforms. For example, the project specifications documents, organized using Master Format, dictate the brand of paint that is to be used, while Trade Definitions determines who is responsible for painting various components of the project. © 2019 Winnipeg Construction Association. Built by BizZone.